I was in the midst of creating two forms. Once I created the first form and a report for that form, I cloned it to create my second form. On the second form I an unable to add a new report (visual builder) using the grid. The header, text, arrow, image, chart buttons work, but the grid button will not work. Or if I try to save the report, it just keep running as it is saving it but never really saves it. I don't believe it a form issue, because I tried to create a second report or save for the one I had already created a report for and for other form and have the same issue. Also, on form prerferences under form limits when I try to enter an expiration date, it keeps saying invalid date, no matter what format or date I put in it. I previously put in a date on a form a few days ago without any problems. I checked your jotform http://www.jotform.us/form/52795121009149 and I see that there was a Grid already on the form Visual Report. When I test adding a Grid to the Report, it had work as well. As you can see on the image above, the Grid look empty because the form doesn't have any existing submisssion data yet. Can you please check again in your Form Builder if are now able to build the Visual Report that include a Grid. Yes, the Visual Report for the Beverage Tub report worked. I understand their is no detail. 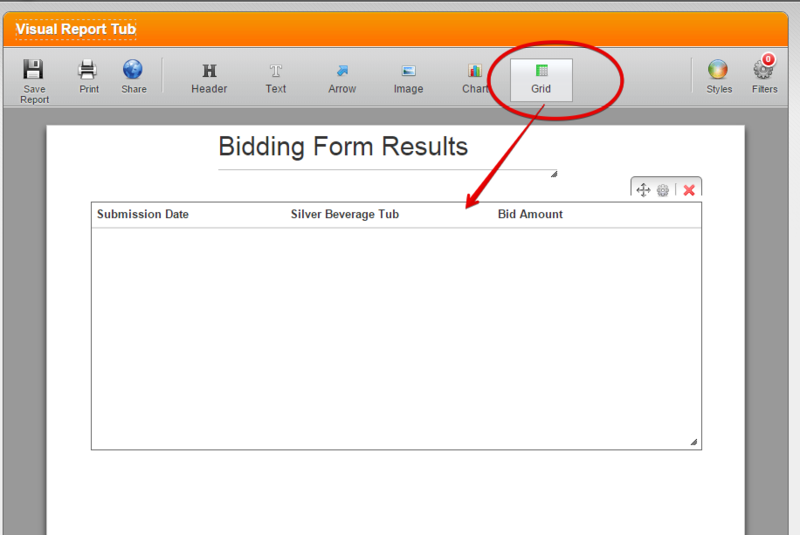 My problem is I can't seem to create another report using Grid for that one or for the other form (Silver Tankards). If you did it without any problem it must be something particular to me, but I am not sure what. I have created these report before. One a week or so ago and the one you saw today. It just won't let me do it anymore? Which is weird. All the other buttons work except the Grid. I can do the header, chart, text, etc. I use FireFox as my browser, do you think that's an issue? It hasn't been in the past. Even with the date issue. I did it last week and it worked. I have not made any changes, but I checked my Firefox update history and a security update was done on the 30th, but I was able to do the Visual report earlier today. I'm confused??? I do believe it a FireFox issue, because I can do the Visual Report and the form expiration date without any problems in IE. Ok, not the date thing. I still didn't work, but the reports do in IE. So I test also using FF browser just to be sure there is a problem. I created a new Visual Report to your jotform http://www.jotform.us/form/52795121009149 within the Firefox browser. But so far it was successful as well. Perhaps check also your FF browser if there were custom settings that could be causing the issue on the Form Builder. If possible try resetting the browser settings to default. I am sorry but so far I could not replicate the issue, so I could not submit a bug ticket report to the higher team support for them to check if there were actual issue. Hope this help. Continue updating us if there are still issue.